I have spent the past few years waiting for wedge-heel shoes to go out of style, but it looks like wedges are here to stay. If you go into a specialty shoe store looking for sandals without a wedge heel, you will be lucky to find even a small handful. 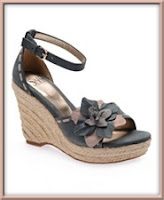 The reason I avoid wedges is not because I find them to be unattractive, but rather because I cannot walk in them. Ever since I seriously sprained my ankle during my senior year of high school, that same ankle has been extremely easy to twist, pull, and sprain. Sometimes I feel like I have sprained it without remembering any specific incident and cannot figure out when exactly it happened. For this reason, I have had to give up wearing wedge and some platform-heel shoes. Something about the way the sole is much narrower than the footbed makes these shoes too "teetery" (yes, I made that word up) for me. I will twist my ankle without fail 90% of the time I wear wedges, so now I am confined to wearing chunky heeled shoes and flats. Yes, I am a little bitter.